Late afternoon has always been my favorite part of the day. as the sun blazes its way further westward. a Quieting of my Soul. or reflect on the day. Sometimes I read, journal or knit. This time of day is a time of anticipation for me. for my loved ones to return to me. see their smiles in my soul. My soul is like a weaned child within me." such a beautiful post! What a blessing to have quiet in the soul. But there's something about this time of stillness when we can catch our breath and just BE. A quieting of the soul...I love that. It's very poetic. It's also much needed in the hustle and bustle of every day life. Porch swing and knitting needles sounds like a great way to spend an afternoon. We all have a lot of hustle and bustle and so much of it is a Good thing... time spent caring for our family and being with our friends. But we need the Quiet places too. 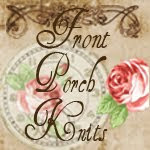 A place to connect with God and remember who we are... and pick up a book, swing on a porch, sip some tea and click some knitting needles.